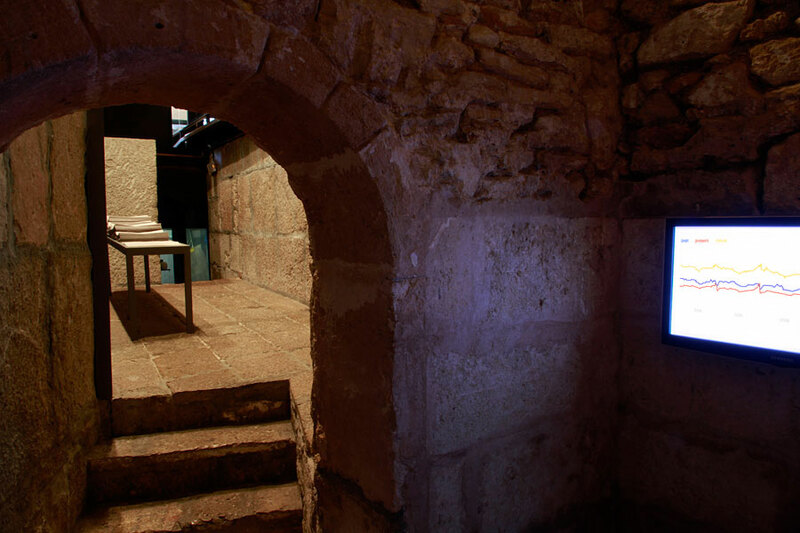 This exhibition comprises a trilogy of interconnected works that examines the role of technology and data and how it relates to the human condition in an age of hyper information. In a world dominated by digital media and the instant accessibility of information, his practice crosses the boundary between art and science to reveal the paradox of the promise of infinite knowledge and an absolute vision against its impossibility due to the transient nature of human perception. 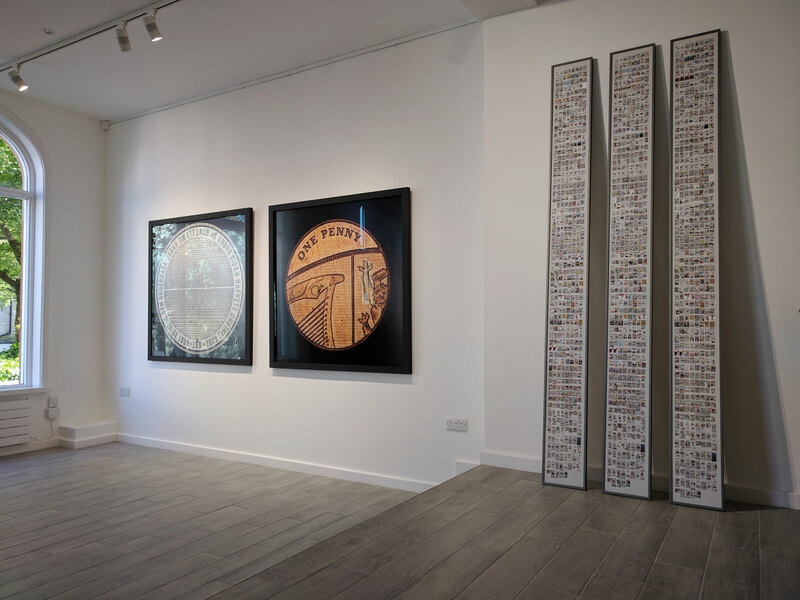 The Fundamental Units: The lowest denomination coin from each of the world’s 166 active currencies are photographed to vast scale using an infinite focus, optical 3D microscope. 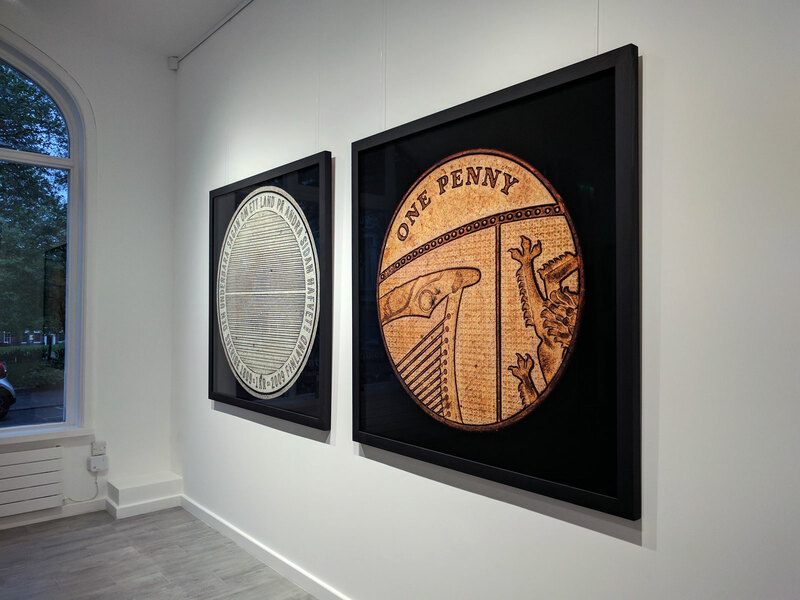 Printed to a size of 1.2 x 1.2 metres from files with over 400 million pixels, the hyper-real level of detail, beyond normal vision, reveals the material construction and make-up of the coin together with the marks and traces from their circulation and use as tokens of exchange. A Planetary Order: This is a 3D scale model of the earth showing cloud cover from one single moment in time. Raw information from one second’s worth of readings from all six cloud monitoring satellites overseen by NASA and ESA is transformed into a physical visualisation of real-time scientific data that delicately outlines and profiles the clouds emerging across the sphere. 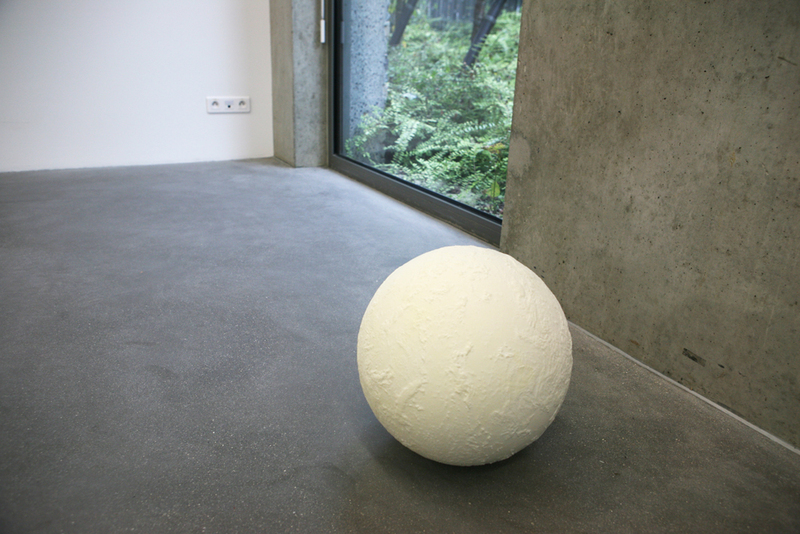 The sphere, or globe, has no added colour, only the sculpted whiteness of the raw material that throws a maze of faint shadows across the structure. Text Trends: This looks at our perception of words and data when displayed in graphical form. Through animation, it uses Google data to explore the content generated by search queries and reduces this process to its essential elements: search terms -vs- frequency searched over time, presented in the form of a graph. 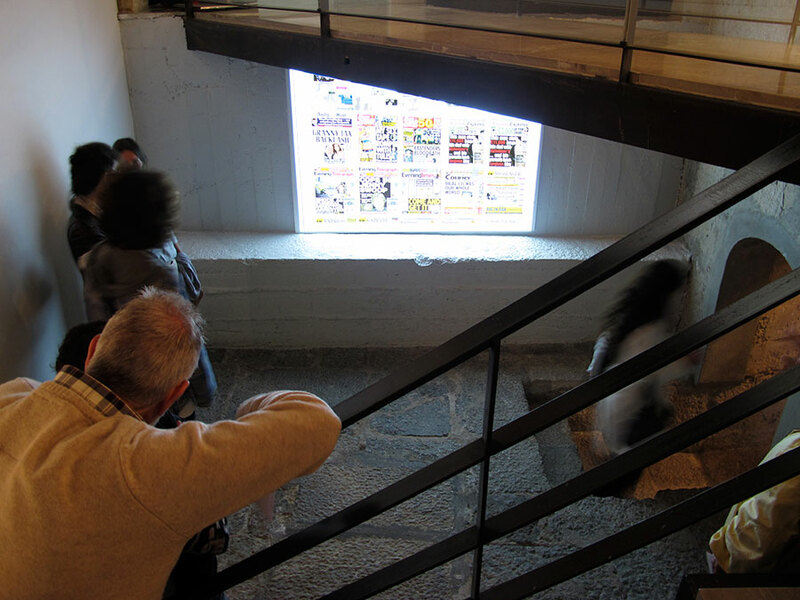 The viewer watches the animation plot out the ebb and flow of search terms generated by internet users around the world. Pairs of words such as ‘now and later’ and ‘summer and winter’ play out matter-of-factly, with all the passion of a market index. Originally an animation, it has also been commissioned as a series of prints. 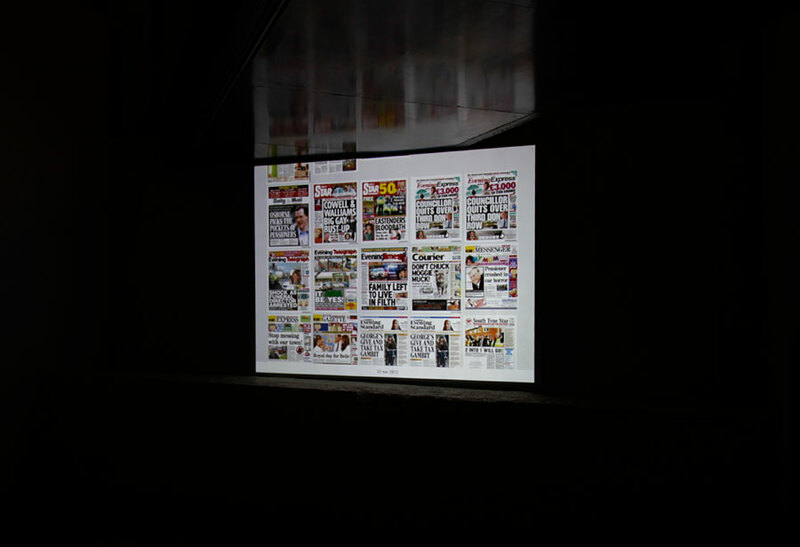 I Wanted to See All of the News From Today: collects everyday over 600 front covers of newspapers from around the world. In his short story “The Library of Babel”, published in 1944, the Argentinian author Jorge Luis Borges imagines the whole of human culture brought together in a labyrinthine library. The books it contains represent the obsessive organisation of all conceivable human thought, in every language and from its beginnings. The concept harks back to the idea that knowledge could ultimately be grasped in its entirety, leading to mastery and omnipotence. 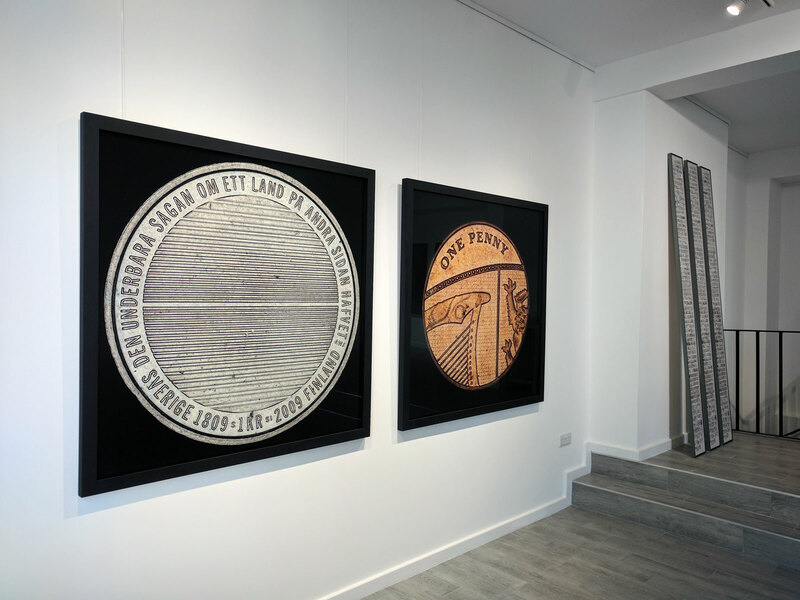 The artwork of Martin John Callanan (Birmingham, 1982) inevitably recalls this literary allusion, but it is immediately clear that it illustrates the way in which our relationship with technology has exactly reversed the terms of its argument. In contrast to Borges, who imagined that all knowledge could be made visible in one place, Callanan acknowledges that today we live in a decentralised information network that irrevocably determines the way we live. 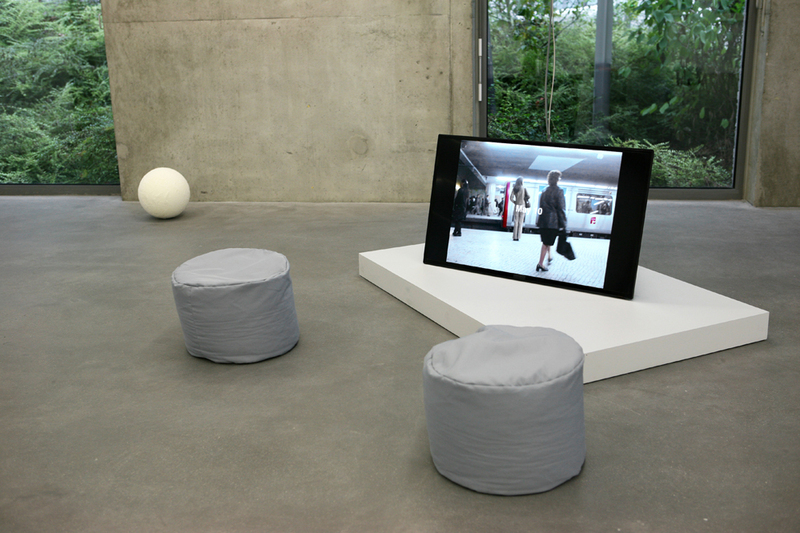 When he describes himself as “an artist researching an individual’s place within systems”, the “place” he refers to does not describe an aesthetic relationship in the traditional sense, in which the observer is dissociated from the things observed; it assumes that we are inextricably connected with them. The exhibition Data Soliloquies establishes a relationship between three works that are clearly complementary in this way. 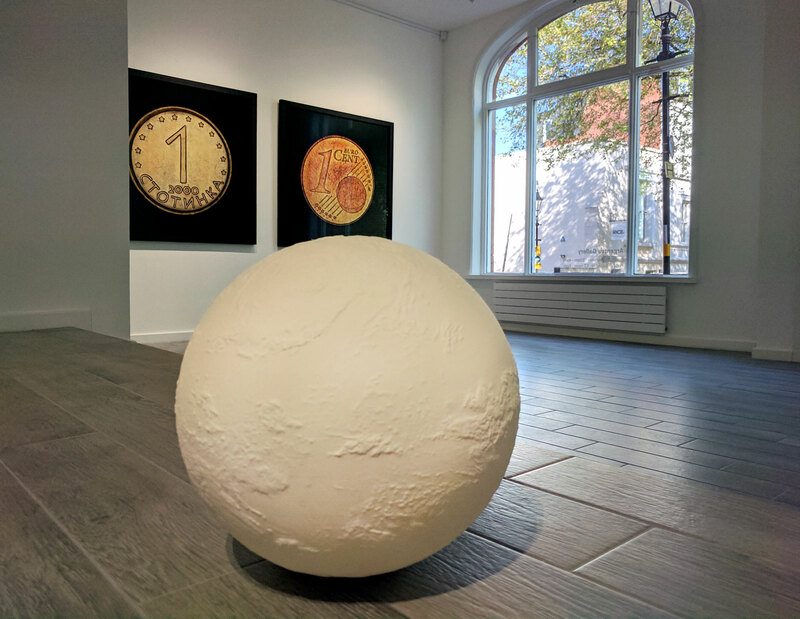 The sculpture A Planetary Order features a 3D scale model of the earth, on which a series of satellite data is combined to show the exact state of the Earth’s cloud cover on a given date. It stands on the floor, making it seem vulnerable, and demonstrates that a phenomenon that is so transitory, while at the same time represented by “hard” data, is fundamentally impossible to grasp, and always beyond complete human perception: technology has not overridden what is incommensurable. 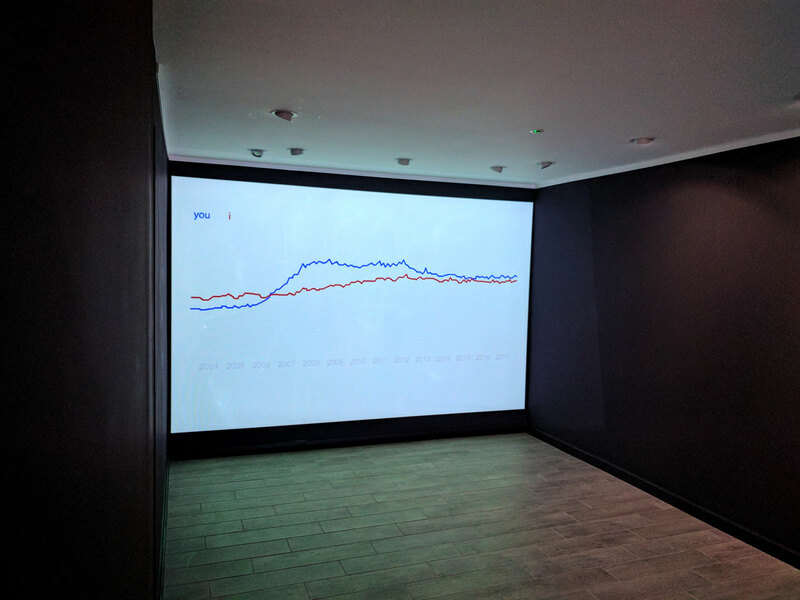 The printed series Text Trends is a statistical comparison of Google searches for pairs of words, from 2004 to the present. The self-referential nature of the relationships between the chosen words (winter/summer, buy/sell, etc.) and the fierce humour that emerges from them, reflect the expectations embodied in these statistics: they represent actual searches of users. Something that might be taken as a single measurement reveals itself to be also an oracle, whose performativity determines our behaviour. 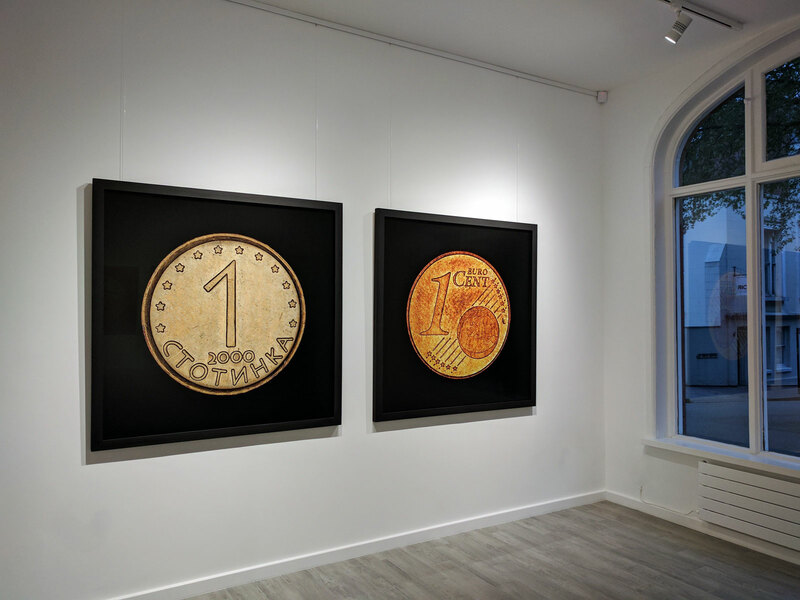 Lastly, The Fundamental Units is a series of images each of which shows the smallest value coin used in various national currencies, photographed using a 3D optical microscope at the National Physical Laboratory, Teddington, UK. 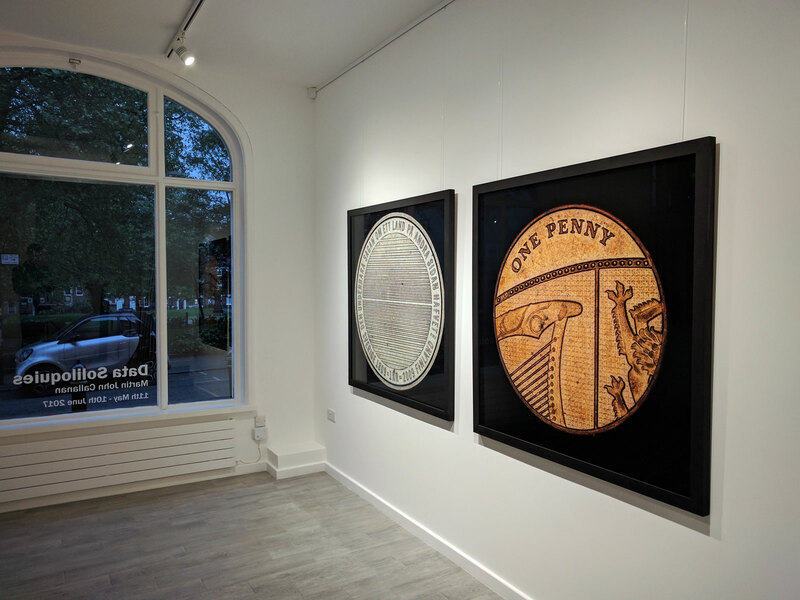 These images are then expanded and printed in extra-large formats, so that they show the all traces of the handling they have undergone, and thus the paradoxical physicality of money, whose exchange is now entirely dematerialised. Despite their power and clear visual precision, these objects sometimes appear cold, as if placed at a distance: the white earth, statistics, coins. They are the product of a conceptual, minimalist approach that emphasises protocol. 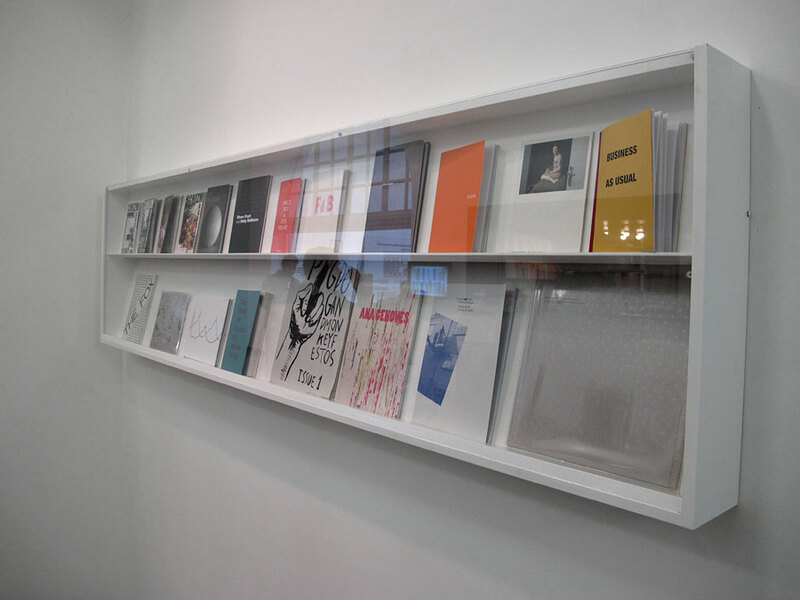 In addition, they contain no trace of the artist: unlike other recent conceptual works which compare human physicality with repetitive systems, as in the case of Roman Opalka or On Kawara, Martin John Callanan does not introduce his own actions into his work, or only very rarely. Moreover and strictly speaking, it hardly matters if we know the positions of the clouds on a given date, the development of Google searches or the way in which the coins in our pockets have aged: in themselves these facts and these objects include nothing that would give them the status of an artwork. In that case, where do we get the feeling that these works speak so profoundly about ourselves? It is at once clear that what these artworks have in common is that they talk about value, and its direct connection with the way generalised quantification has become the dominant paradigm and the universal criterion for representing and evaluating human affairs. Callanan also addresses the idea of value from a very specific point of view, namely an almost deliberate focus on representing totalities. 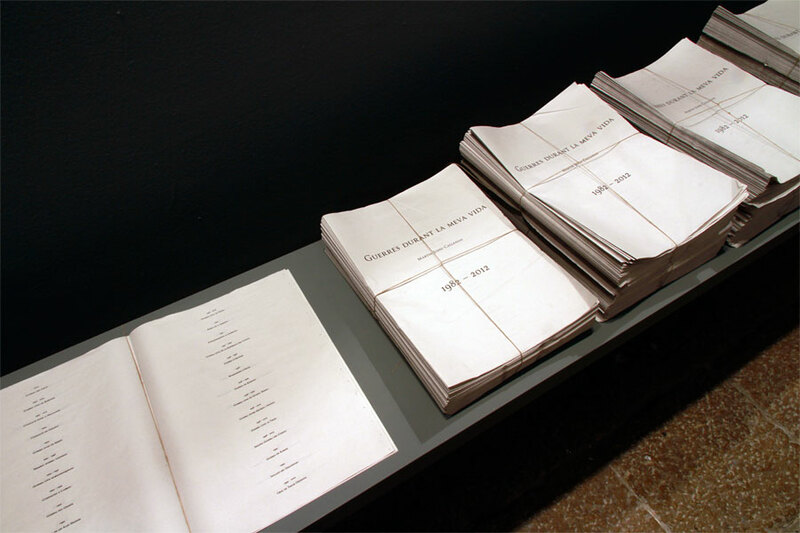 An overview of his work reveals the consistency of that approach, seen even in their titles: every flight departure, every internet search, every war waged during the artist’s lifetime, all his actions when using software, every telephone number, the number of people who have ever lived, the number of days of his life, every newspaper front-page, every cloud present above the earth at a given moment, to visit the whole of London, and so on. This approach may seem simplistic but it selects precisely those phenomena to which our sensory experience never gives us complete access. 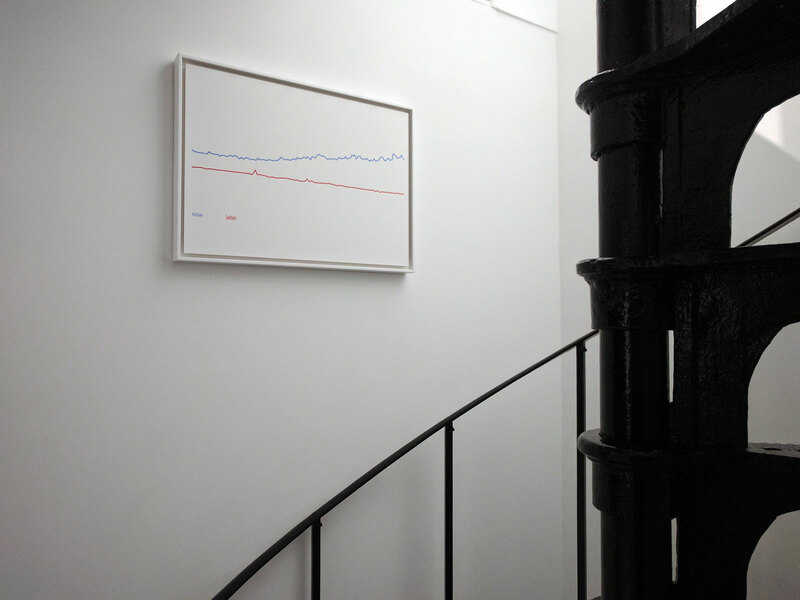 Given that the world of data is characterised by the very fact that the global calculations performed by systems are beyond human perception, can artworks reverse that relationship? 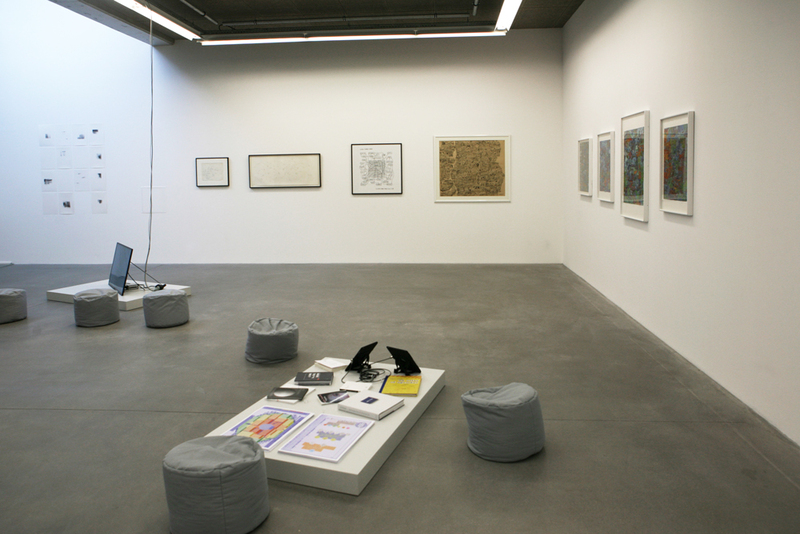 We then see that each of these artworks takes a specific physical form, which reflects a profound knowledge of coding, networks and computing, applied to a wide range of forms: sculptures, prints, artists’ books, objects or performances. 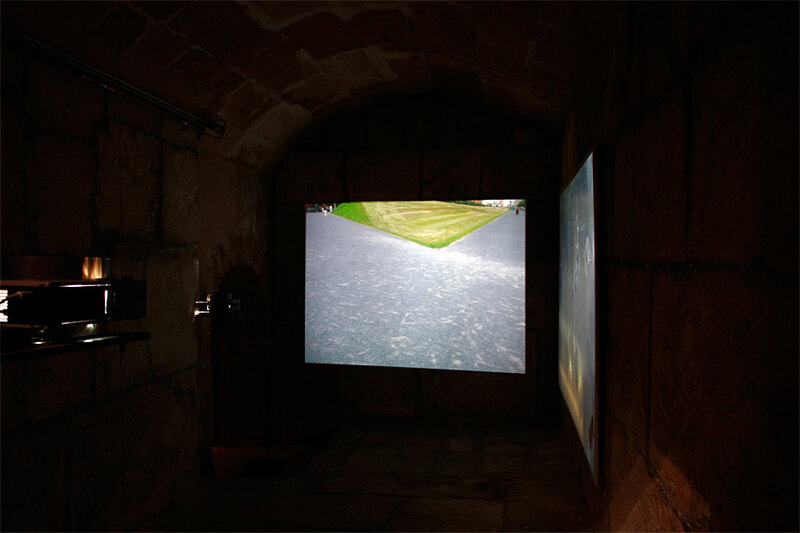 Using this vocabulary, Callanan offers a parallel set of “aiming devices” that connect the various totalities in order to show more clearly that we can never have complete control over them: having departure times appear briefly on a screen or a town crier proclaim the dates of wars; printing the clouds on a 3D sculpture that cannot be seen as a whole; demonstrating the performative nature of statistics and opinion polls and the physicality of money, or creating a publication that cannot be read due to its enormous scale. Each of these situations creates a paradox: they open up a divide between, on the one hand, the promise of omniscience and a totalising vision, and on the other, its impossibility, due to the inevitably fugitive and local nature of human perception. It is in this gap, this falling-short, that the agency of Callanan’s works resides. In this way, by creating a very specific relationship between these successive stages –value, totality, promise and falling-short – Callanan reveals what we expect from these representations. It is a question not so much of value itself, than the desire for value; less one of totality than the dream of totality, less one of control than of what eludes it. All of these issues bring us back to the human condition, its desires and its limitations. This is where we find the poetic but also the profoundly critical aspects of a body of work that brings us face to face with the multiple manifestations of the infinite, only to assert our inability to embrace it. 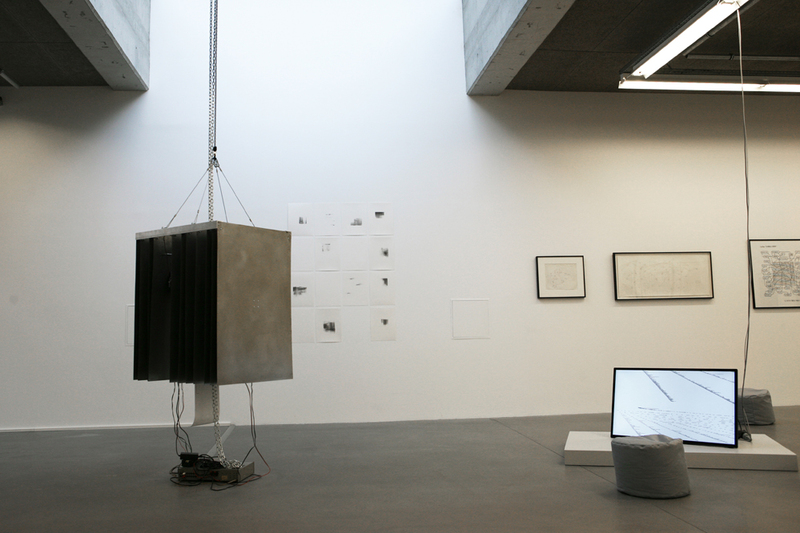 The artwork also emphasises the radically futile nature of all approaches that place an excessive emphasis on technology. What differentiates us from the “systems” invoked by the artist is that we also find meaning in things we do not understand. This brings to mind the writer and critic John Berger, who showed that one of the specific characteristics of art is not to represent things in themselves but to identify the way we see them, enabling us to interrogate the ways in which that experience is formed and determined, including politically. 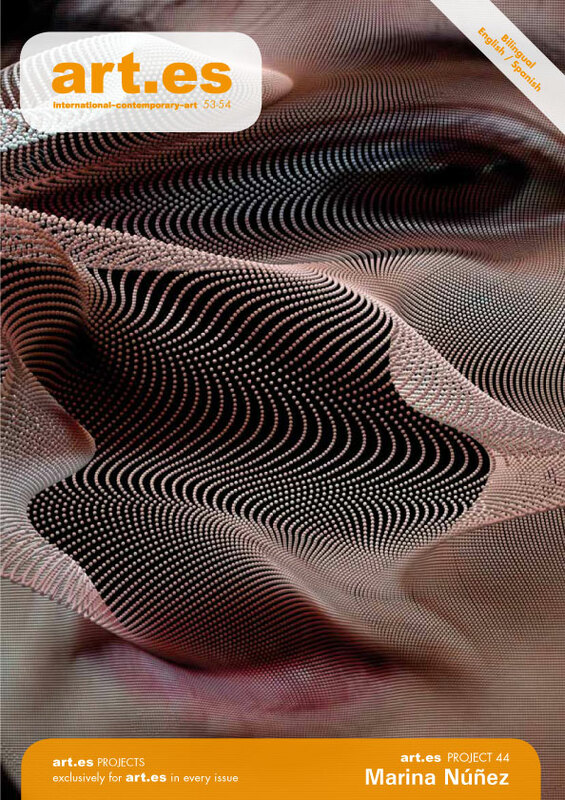 At a time when many projects facing the issues raised by digital cultures fall into the trap of the figuration (of data, artificial intelligence, surveillance and so on), Martin John Callanan assumes the vain character of such an approach and positions himself at a point where his research leads us to a vertigo. With his characteristic modesty, with his works, their “data soliloquies” and the way they suggest that we would never seize them, he illuminates the specificity of the human’s condition vis-à-vis the immensity of the world. Thierry Fournier is a French artist and curator. He also co-directs the curatorial research group Ensad Lab Displays. He lives and works in Aubervilliers. Dans sa nouvelle La Bibliothèque de Babel publiée en 1944, l’écrivain argentin Jorge Luis Borges imagine la totalité de la culture humaine exposée dans une bibliothèque à l’architecture labyrinthique. Les livres qu’elle rassemble contiennent toute la pensée imaginable, dans toutes les langues et depuis les origines, obsessionnellement mis en ordre. L’ensemble évoque la promesse d’accéder enfin à la totalité de la connaissance, à travers le rêve d’une maîtrise et d’une toute-puissance du savoir. Si le travail de Martin John Callanan (Birmingham, 1982) évoque immanquablement cette image littéraire, c’est pour constater aussitôt qu’il témoigne de la manière dont nos relations à la technologie en ont précisément renversé les termes. À l’inverse de Borges qui imaginait que l’ensemble du savoir puisse être visible en un seul lieu, Callanan prend acte que l’humain contemporain est pris dans un réseau d’informations décentralisées qui conditionnent en permanence son existence. 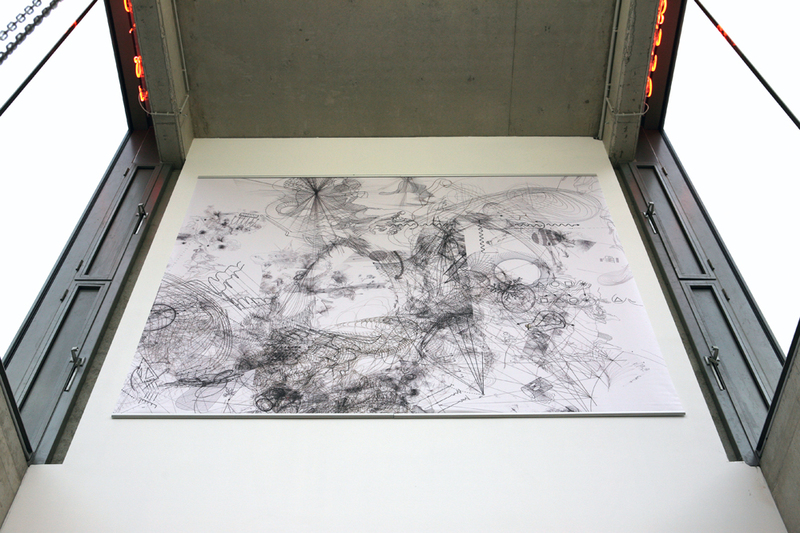 Lorsqu’il se décrit comme « an artist researching an individual’s place within systems » (un artiste explorant la place de l’individu parmi des systèmes), la « place » qu’évoque l’artiste ne décrit pas une relation esthétique au sens classique qui dissocierait l’observateur des objets observés : elle prend acte que nous sommes pris dans leurs logiques. L’exposition Data Soliloquies met ainsi en relation trois œuvres dont les propos sont particulièrement complémentaires à cet égard. La sculpture A Temporary Order figure le globe terrestre en impression 3D à petite échelle, sur lequel est gravé l’état exact des nuages à une date donnée, obtenue par la combinaison de séries d’images par satellite. Posée au sol, comme vulnérable, elle met en évidence qu’un phénomène aussi fugitif, même figé et représenté par ses données, demeure radicalement insaisissable et continue à échapper à notre perception : la technique n’a pas désactivé l’incommensurable. 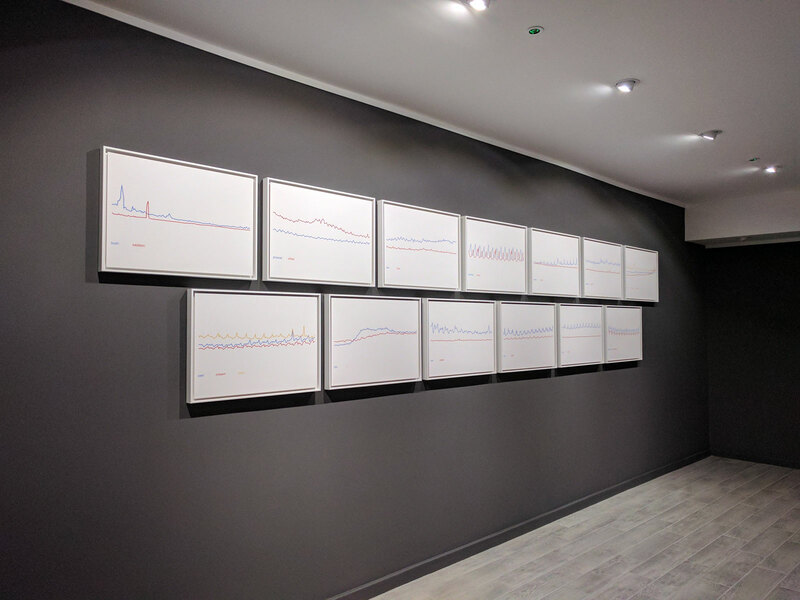 La série d’impressions Text Trends montre quant à elle des statistiques comparées de paires de mots issues des requêtes sur Google de 2004 à nos jours. Le caractère tautologique des associations de mots choisis et l’humour féroce qui s’en dégage (été-hiver, acheter-vendre, etc.) témoigne des attentes que reflètent ces statistiques : il s’agit bien de requêtes formulées par des utilisateurs. Ce que l’on pourrait prendre comme une seule mesure est aussi un oracle, dont la dimension performative conditionne nos comportements. Enfin, The Fondamental Units est une série d’images montrant chaque fois les plus petites unités de pièces de monnaies internationales, photographiées au microscope électronique au National Physical Laboratory de Teddington (Royaume-Uni). Ces images sont ensuite démesurément agrandies et imprimées sur de très grands formats, révélant alors toutes les traces des échanges dont elles ont été l’objet – et, par la même, la physicalité paradoxale d’une monnaie dont les échanges sont aujourd’hui entièrement dématérialisés. Malgré leur force et leur précision plastique évidente, ces objets sont parfois froids, comme mis à distance : globe blanc, statistiques, pièces de monnaie. Ils héritent d’une approche conceptuelle et minimaliste qui privilégie les protocoles. En outre, toute trace de l’artiste en est absente : par opposition à des démarches qui, dans l’histoire de l’art récente, ont confronté l’humain et sa corporéité à des systèmes répétititifs, comme celles de Roman Opalka ou de On Kawara, Martin John Callanan – à de très rares exceptions – ne met pas en jeu ses propres actions. En outre, à strictement parler, peu nous importe de savoir quelles étaient les positions des nuages à une date donnée, de connaître l’évolution de requêtes sur Google ou encore comment vieillit la petite monnaie : ces faits ou ces objets en eux-mêmes n’évoquent rien qui les rapprocheraient du statut d’une œuvre. Comme extraits du monde, ils semblent être des objets trouvés dans un champ de données. D’où nous vient alors le sentiment que ces œuvres nous parlent aussi profondément de nous-mêmes ? Le premier constat qui émerge alors est que ces œuvres ont toutes en commun de parler de la valeur, qui interroge directement la manière dont la quantification généralisée s’est imposée aujourd’hui comme paradigme dominant et comme critère omniprésent de représentation et d’évaluation de l’humain. Callanan convoque en outre cette notion de valeur à travers une perspective très spécifique, qui est de viser presque systématiquement la représentation de totalités. Un regard sur l’ensemble de ses œuvres témoigne de la constance de cette démarche, que l’on retrouve même dans leurs titres : toutes les partances de vols, toutes les recherches sur internet, toutes les guerres pendant ma vie, toutes mes commandes sur un logiciel, tous les numéros de téléphone, le nombre de tous ceux qui ont jamais vécu, le compte de tous les jours de ma vie, toutes les unes de la presse, tous les nuages présents en un instant au-dessus de la Terre, voir tout Londres, etc. Cette démarche de all-everything pourrait sembler simpliste mais elle sélectionne justement des phénomènes auquel notre expérience sensible ne nous donne jamais totalement accès. Alors que le régime des données se caractérise justement par le fait que des totalités calculées par des systèmes échappent à la perception humaine, des œuvres peuvent-elle renverser cette relation ? On voit alors que ces projets déploient chaque fois une matérialité spécifique, qui témoigne d’une connaissance approfondie du code, du réseau et du numérique tout en embrassant un très large répertoire de formes : sculptures, impressions, livres d’artiste, objets, performances… À travers ce vocabulaire, Callanan propose autant de dispositifs de « visée », qui relatent des totalités pour mieux mettre en évidence l’impossibilité de leur maîtrise : faire fugitivement défiler les horaires de vols sur un écran, faire déclamer les dates des guerres par un crieur, imprimer les nuages sur une sculpture en 3D dont la perception globale est impossible, démontrer le caractère performatif des statistiques et des sondages, mettre en évidence la matérialité de la monnaie, créer une publication devenant illisible par son échelle gigantesque, etc. Chacune de ces situations crée alors un paradoxe : elle ouvre un gouffre entre d’une part la promesse d’une omniscience ou d’une vision totalisante, et d’autre part son impossibilité même, due au caractère irrémédiablement fugitif et local de notre perception. C’est dans cet écart, dans ce manque, que réside fondamentalement l’agentivité de ses œuvres. Ainsi, par la relation très spécifique que Martin John Callanan élabore entre ces paliers successifs – la valeur, la totalité, la promesse et le manque – il met en évidence ce que nous attendons de ces représentations. Il ne s’agit pas tant de la valeur, que du désir de la valeur ; de la totalité, que du rêve de la totalité ; de la maîtrise, que de ce qui lui échappe. L’ensemble nous ramène à la condition humaine, à son désir et et à ses limites. Ici se revèle la dimension à la fois poétique et fondamentalement critique d’un travail qui nous place face à de multiples manifestations de l’infini pour pointer immédiatement notre impossibilité à l’embrasser, en même temps que le caractère radicalement vain à cet égard de toute démarche techniciste. Ce qui nous différencie des « systèmes » qu’évoque l’artiste est que nous trouvons aussi du sens dans ce que nous ne comprenons pas. On peut penser ici enfin à l’auteur et critique John Berger, qui relevait qu’une des spécificités de l’art est de ne pas représenter les choses en elles-mêmes mais bien le regard que nous portons sur elles et, par la même, de pouvoir questionner les enjeux de sa formation et de sa détermination (y compris politique). Au moment où, en prise avec les questions ouvertes par la culture numérique, de nombreuses démarches tombent dans le piège de la figuration (des données, de l’intelligence artificielle, de la surveillance…), Martin John Callanan assume ici l’impossibilité radicale d’en venir à bout et s’installe là où cette recherche ouvre sur un vertige. Avec la pudeur qui le caractérise, par ses œuvres, leurs monologues de données et l’incapacité qu’elles évoquent de nous en emparer complètement, il éclaire ainsi la spécificité de la position humaine face à l’infini du monde. Thierry Fournier est un artiste et curateur français. 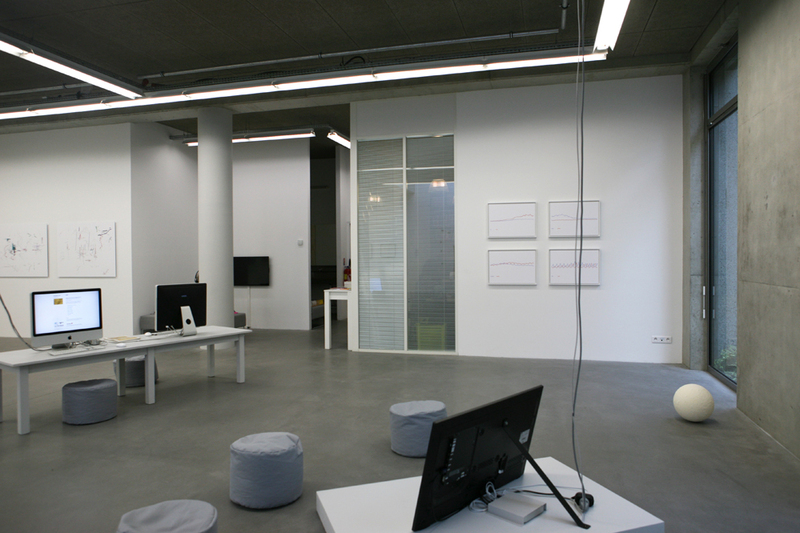 Il co-dirige également le groupe de recherche curatorial EnsadLab Displays. Il vit et travaille à Aubervilliers. Digital network: websites and movies by Mark Boulas, Brian Knappenberger, Laura Poitras, Sandy Smolan, Mareike Wegener, etc. 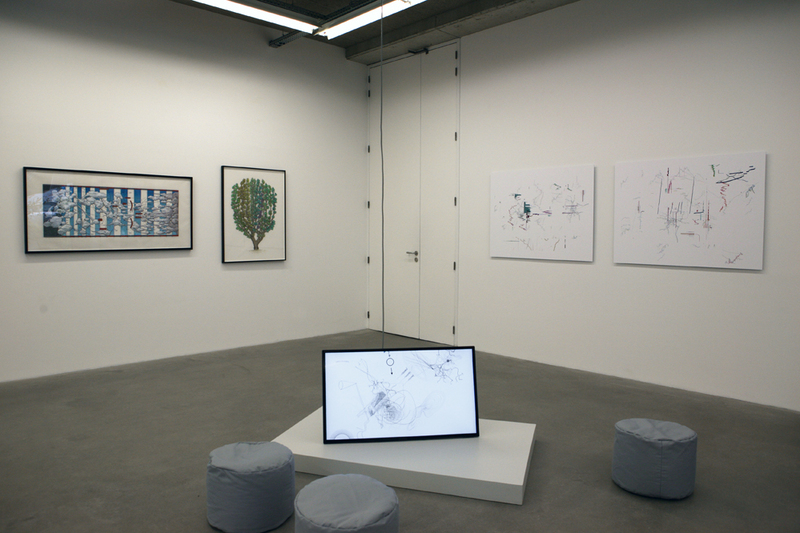 The exhibition Data on view brings together a selection of works that offer interpretations of public or personal data through drawing or code: graphs, drawings, network installations, sculptures, publications… These works are addressing various stakes, sensitive and poetic but also critical or political. They question in particular what we expect from data, and how these expectations are likely to define our vision of the world. In this way, the exhibition offers a historical perspective, ranging from Oyvind Fahlström or Mark Lombardi to young international artists, some of whose works are being shown here for the first time in France. It is supplemented by film and web site documentations, which deals with the issues of empowerment and the appropriation of data by citizens. The New Materialisms series of exhibitions aims at reflexive production tackling historically divergent art practices and discursive fields of Concrete and Conceptual Art related to them, as defined in the 1960s (especially through the notions of modernity and postmodernity), but also with understanding of those practices via perspectives of post-media approaches to art and the post-digital condition of contemporary society. 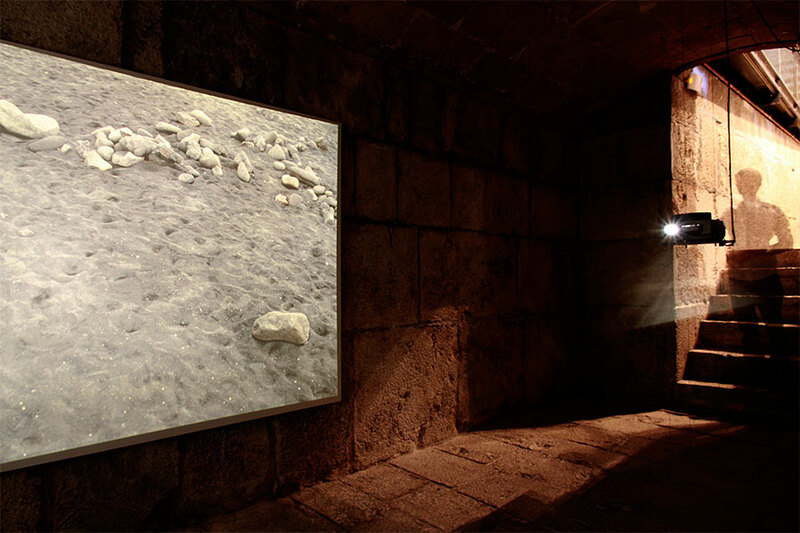 In that sense, the project’s intention is to formulate dialogues among important authors of these previous periods and contemporary practitioners who work within a post-media context, mirroring “organic” conditions while assuming the design of aesthetic experience as important mechanism which has its agency in the process of creating the physical world. New Materialisms explores the German philosopher Max Bense’s identification of the ‘aesthetic condition’, and his proposition that ‘the aesthetic condition is as material as the physical condition of any observed object’. His analysis pursued the goal of ‘programs for the production of aesthetic conditions’, using early computing machines. Materials relating to the infamous clash at a 1970 panel discussion between Bense and Joseph Beuys, which has been described as ‘the visibly spectacular finale to the project of a rational, mathematically oriented aesthetics’, are included in the project. 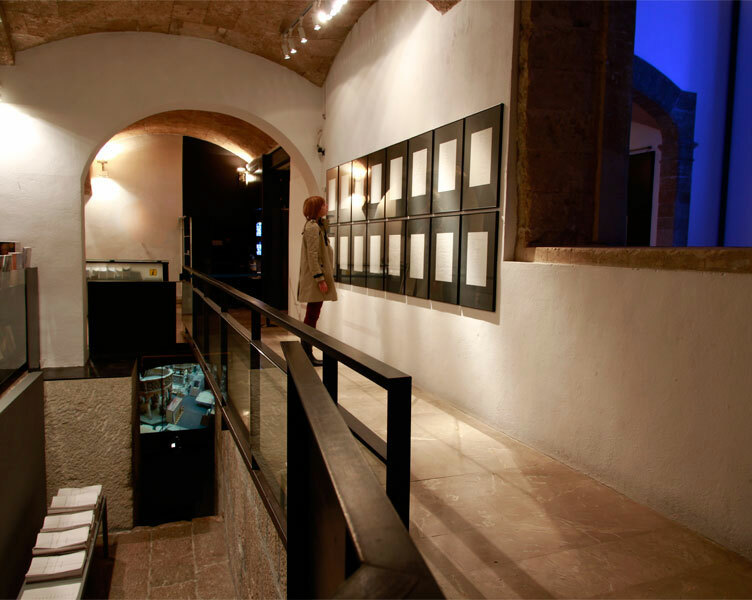 New Materialisms is a long-term program of exhibitions conceptualized in a collaborative process that has been taking place among grey) (area – space for contemporary and media art from Korčula, Croatia and HICA (Highlands Institute for Contemporary Art) from Scotland. Open Source Vostok invites the viewer on a journey back over 400,000 years, through four kilometers of ice, and through almost cosmic cold, to “touch” the untouchable, to feel the real albeit immaterial, and to see an exact optical copy of the ice core and freshly frozen water in the ancient glacial body of water – Lake Vostok. There is not one laboratory in the world that could provide all the conditions found under its icy suit of armor.Open Source Vostok uses this holographic technique to offer the viewer immediate access to one of the least accessible places on Earth, isolated from the surface for more than 15 million years.The artwork in collaboration with Arctic and Antarctic Research Institute (St.Petersburg) and Scientific-production holographic laboratory (St. Petersburg). how the data is generated; prompting the question what does the data actually represent? Installation Voyager/ non-human agent by Špela Petrič and Miha Turšič uses algorithm and data collected from the instruments from the spacecraft Voyager, which since 1977 has been travelling across the universe. Existing space programs focus mainly on understanding the farthest of our surroundings and on developing technological solutions, but tend to overlook the importance of implementing artistic development practices and methodologies in the form of a basic question: What is it like to be a human in space? Voyager/ Non-human Agent project investigates the possible art forms in outer space, a composite of art and science, and the processes of science culturalization. 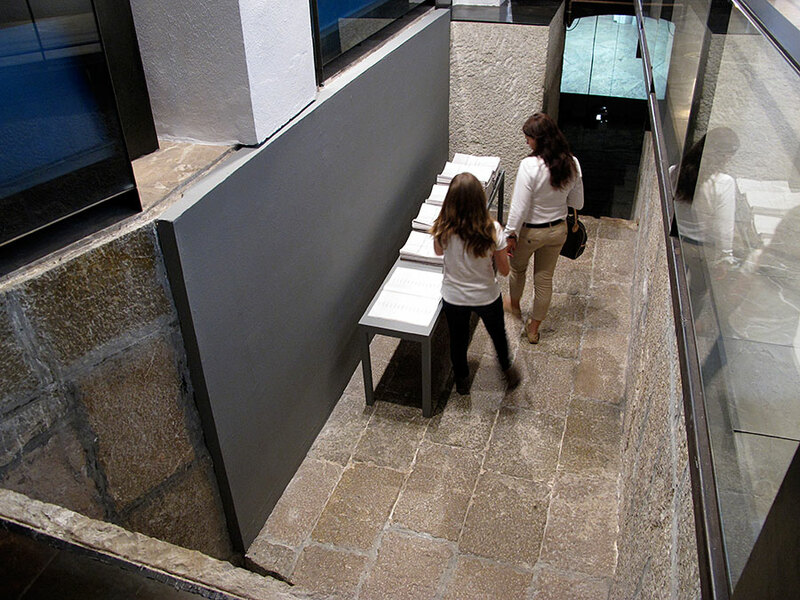 Architecture of the auditorium is a physical, institutional space and the space which generates meaning. The key ideas from Max Bense’s ‘Aesthetics and Programming’ (1968) are coded in zeros and ones and animated as lifting and lowering the seats. 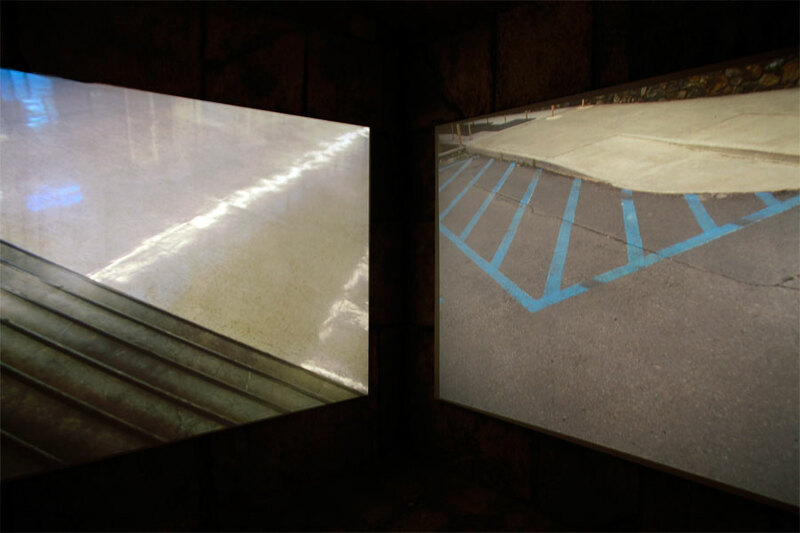 In the geometry of a static shot, elements of architecture and space become the subject of a visual experiment. The video consists of three parts: activation (drawing the auditorium out) – coding (central part) – deactivation (drawing the auditorium in). 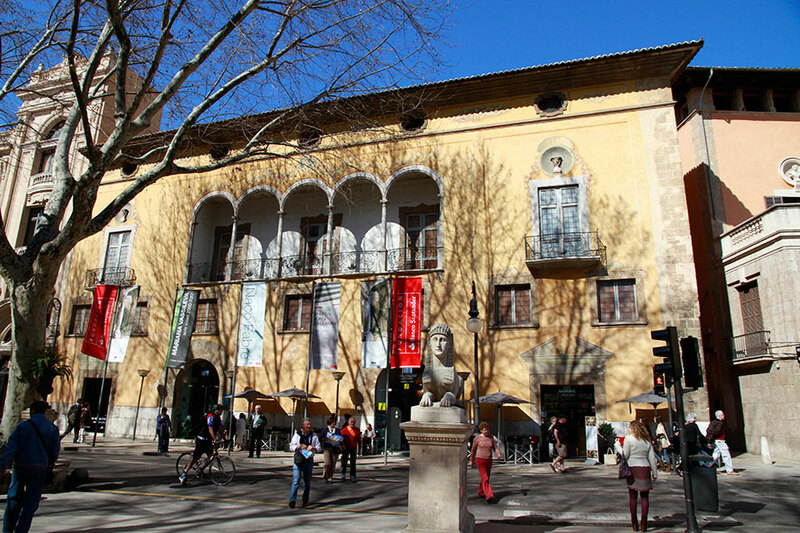 Video DOC cinema programme at Media Art Futures, Murcia, 15-30 April 2015 features both Text Trends and documentary video of Departure of All. 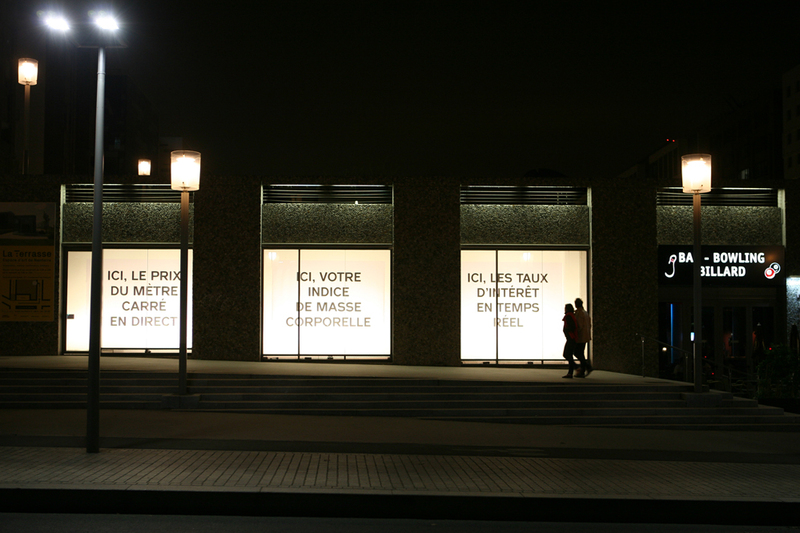 The 44th International Film Festival Rotterdam will take place 21 January – 1 February 2015, and include Departure of All and Text Trends in the Signals: 24/7 programme. Although much has been said about C.P. Snow’s concept of a “third culture”, we haven’t actually reached an understanding between the spheres of science and humanities. This is caused in part by the high degree of specialisation in each field, which usually prevents researchers from considering different perspectives, as well as the controversies that have arisen between academics, exemplified by publications such as Intellectual Impostures (1998) in which physicists Alan Sokal and Jean Bricmont criticise the “abuse” of scientific terminology by sociologists and philosophers. Yet there is a growing mutual dependency of both fields of knowledge, as the one hand our society is facing new problems and questions for which the sciences have adequate answers and on the other scientific research can no longer remain isolated from society. Some scientists, such as the astronomer Roger Frank Malina, have even argued that a “better science” will result from the interaction between art, science and technology. Malina presents as an example the “success of the artist in residence and art-science collaboration programs currently being established” , and considers the possibility of a “scientist in residence” program in art labs. Our relationship with the environment is certainly one of the main problems we are going to face during this century and it is also a subject that brings up the necessary communication between science and society. 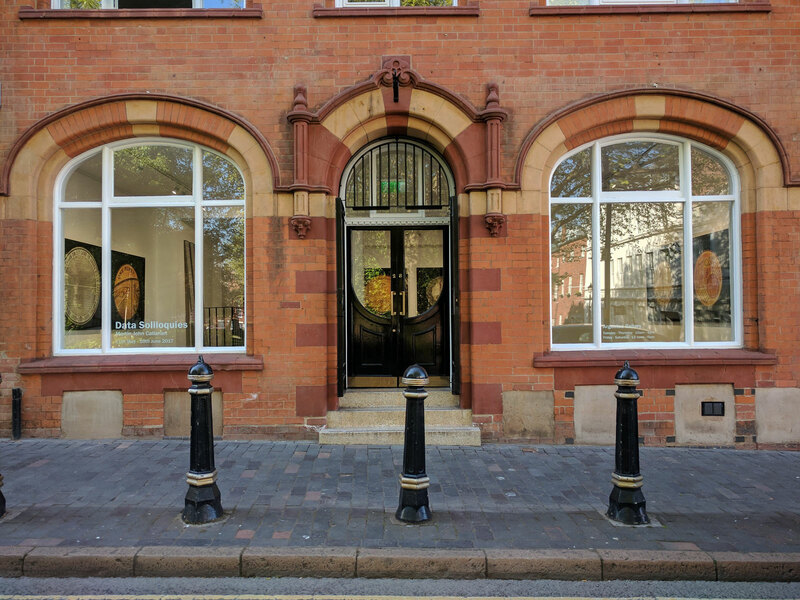 The UCL Environment Institute  was established in 2003 to promote an interdisciplinary approach to environmental research and make it available to a wider audience. While being representative of almost every discipline in the University College London, it lacked an interaction with the arts and humanities. 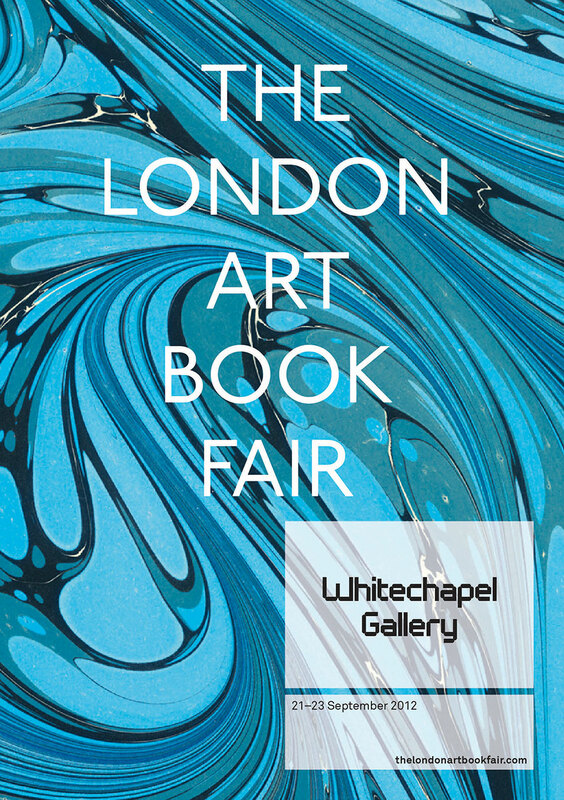 This gap has been bridged by establishing an artist and writer residency program in collaboration with the Slade School of Fine Arts and the English Department. 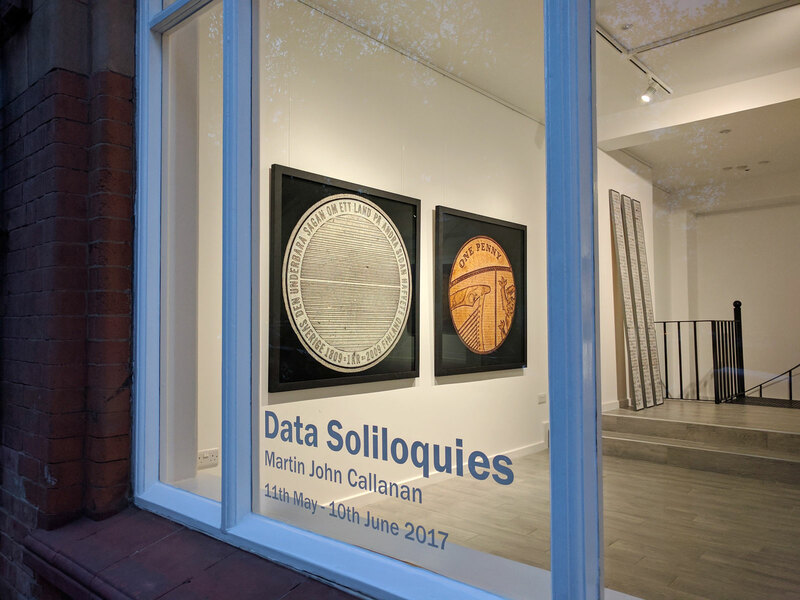 Among 100 applications, writer Richard Hamblyn and artist Martin John Callanan were chosen for the 2008-2009 academic year: Data Soliloquies is the result of their work. As the amount of data regularly stored in all sorts of digital supports increases exponentially, and new forms of data visualisation are developed, these “data monologues” become ubiquitous, while remaining unquestioned. In his text, Hamblyn exposes the inexactitude in some popular visualisations of scientific data, which have set aside accuracy in favour of providing a more eloquent image of what the gathered evidences are supposed to tell. On the one hand, Charles D. Keeling’s upward trending graph of atmospheric carbon dioxide concentration, which according to Hamblyn is “probably the most important data set in environmental science, and has become something of a freestanding scientific icon”, or Michael Mann’s controversial “Hockey Stick” graph are illustrative examples of the way in which information displays have developed their own narratives. On the other, the manipulation of data in order to obtain a more visually effective presentation, such as NASA’s exaggeration of scale in their images of the landscape of Venus or the use of false colours in the reproductions of satellite images, call for a questioning of the supposed objectivity in the information provided by scientific institutions. In the field of climate science, the stories that graphs and other visualisations can tell have become of great importance, as human activity has a direct impact on global warming, but this relation of cause and effect cannot be easily determined. As Hamblyn states: “climate change is the first major environmental crisis in which the experts appear more alarmed than the public” . The catastrophism with which environmental issues are presented to the public generate a feeling of impotence, and thus any action that an individual can undertake seems ineffective. The quick and resolute reaction of both the population and the governments in the case of the “ozone hole” in 1985 points in the direction of finding a clear and compelling image of the effects of climate change. As Hamblyn underscores, this is not only a subject for engineers: “the reality of ongoing climate change has yet to be embraced as a stimulus to creativity â€“in the arts as well as the sciencesâ€“ or as a permanent and inescapable part of human societal development” . Martin John Callanan took upon himself to develop a creative response to this issue, and has done so, not simply by creating images or objects but by depicting processes. He states: “I’m more interested in systems â€“systems that define how we live our lives” . A quick look at his previous work  will show how appropriate this statement is: he has visited each and every station of the London underground, collected every command of the Photoshop application in his computer, officially changed his name (to the same he already had), gathered the front page of hundreds of newspapers from around the world and engaged himself in many other activities that are as systematic and mechanical as ironic, poetic or simply nihilistic. 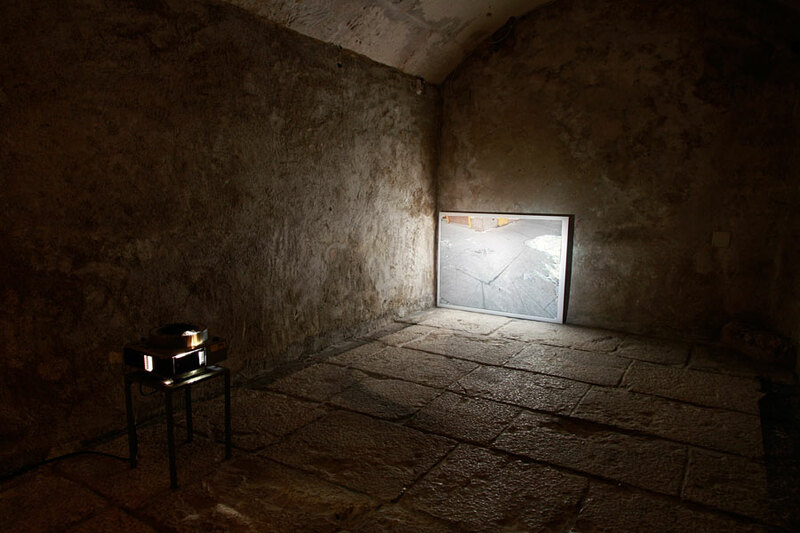 During his residency, Callanan created to main projects. 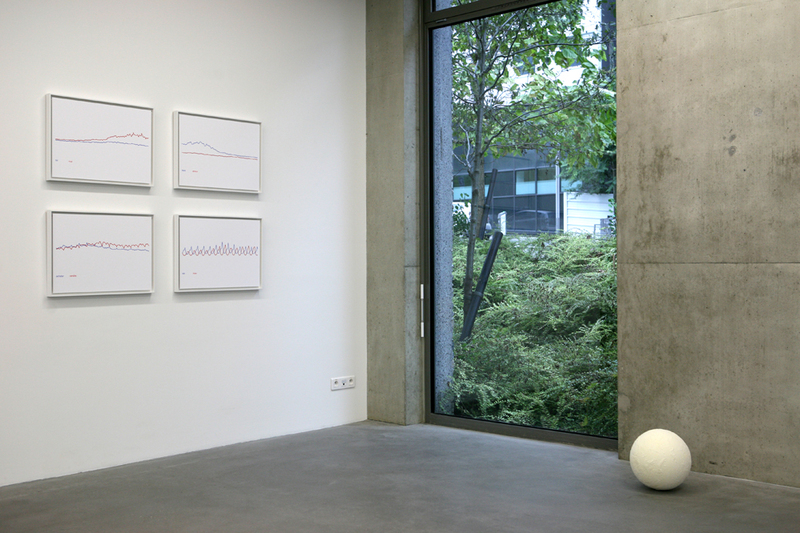 The first one, Planetary Order, is a globe in which the patterns of the clouds on a particular date (February 6th, 2009) have been sculpted. 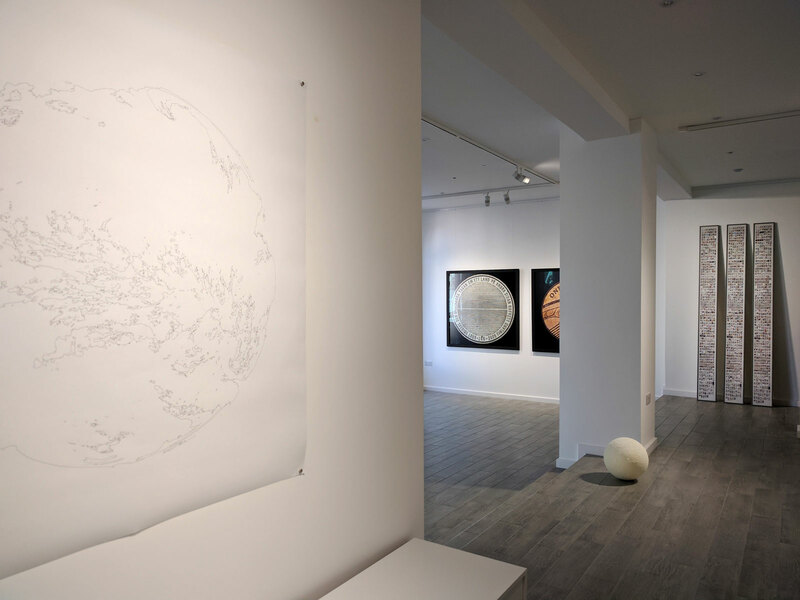 The artist composed the readings of NASA’s cloud monitoring satellites in a virtual 3D computer model, which was then laser melted on a compacted nylon powder sphere at the Digital Manufacturing Centre at the UCL Bartlett Faculty of the Built Environment. The resulting object is a sculpture, an artwork more than any sort of model in the sense that it develops a discourse beyond the actual presentation of data. 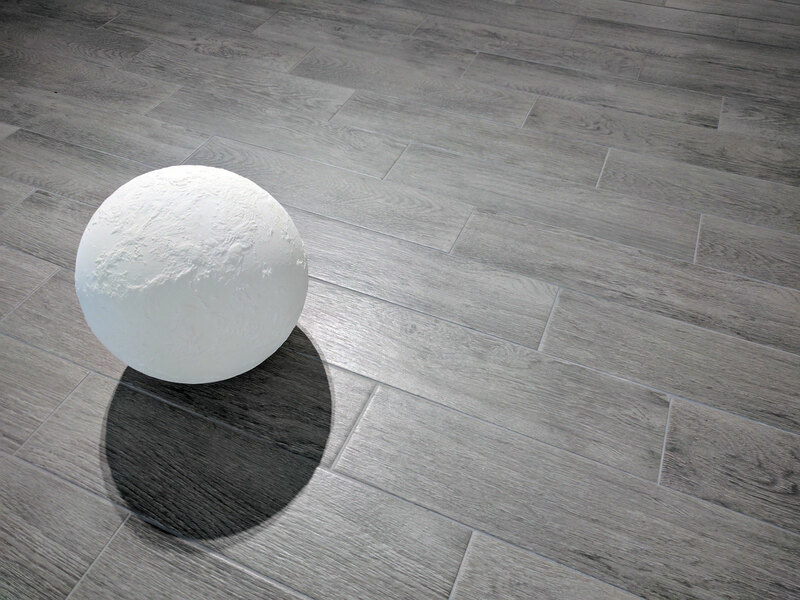 An impeccable white sphere textured by its subtle protuberances, the globe evokes the perfection of an ancient marble sculpture while presenting us with an uncommon view of the Earth, covered with clouds. The clouds, which are usually erased in the depictions of our planet in order to let us see the shapes of the continents (the land which is our dominion), become an icon of climate change and the image of an order which is, in all senses, above us. Callanan freezes the planetary order of clouds in an impossible map, a metaphorical object which appears to us as a faultless, yet fragile and inscrutable machine. 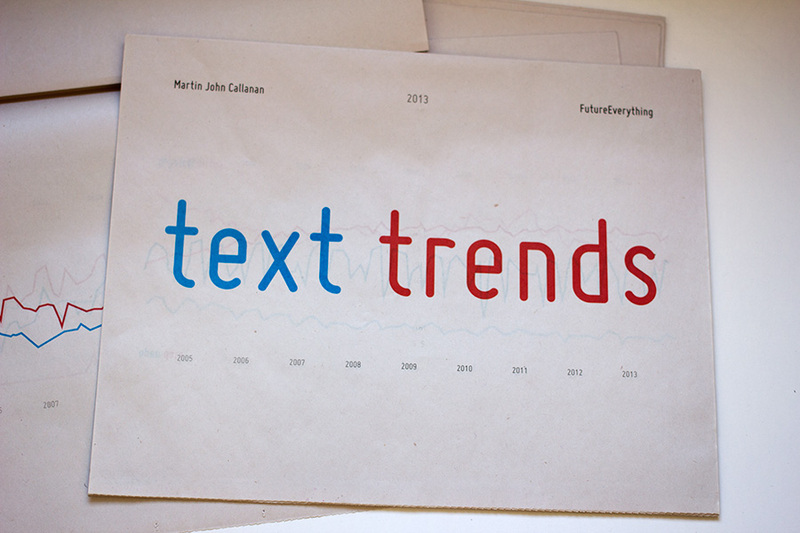 The second of Callanan’s artistic projects is the series Text Trends. 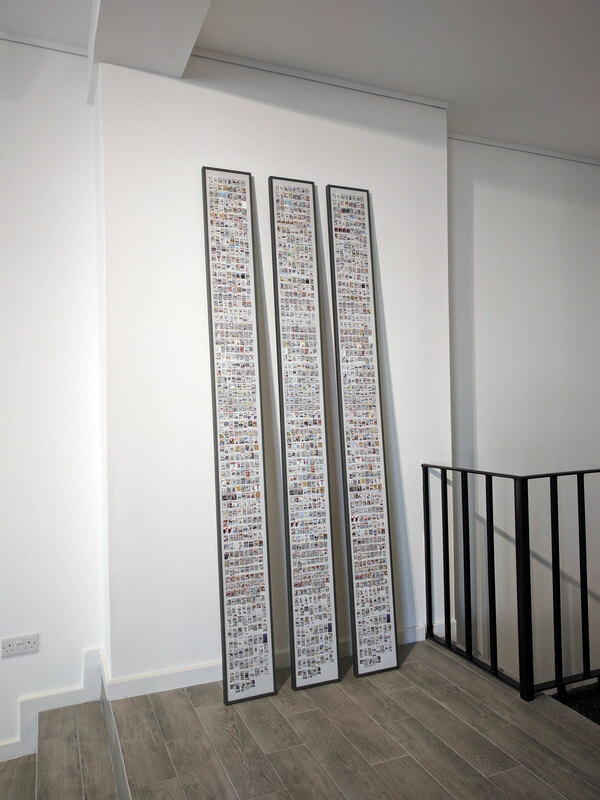 Using Google data, the artist has collected the number of searches for selected terms related to climate change in a time range of several years (from 2004 to 2007-2008). 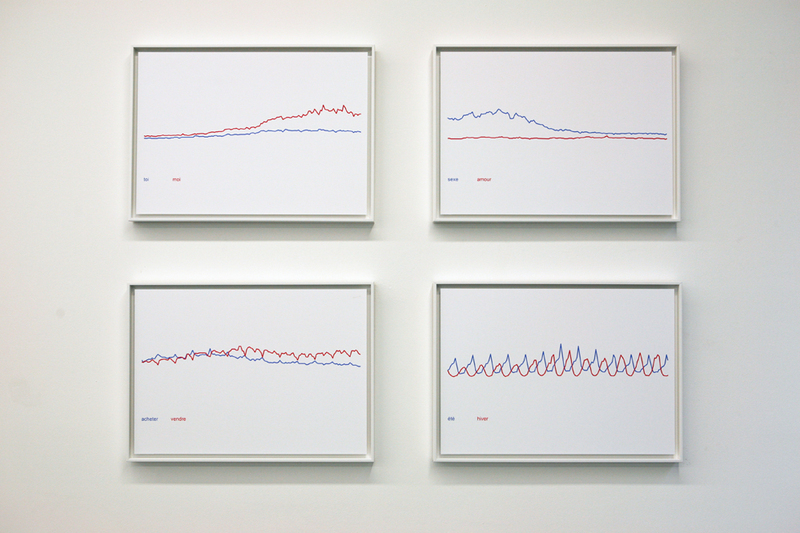 With this data, he has generated a series of minimalistic graphs in which two jagged lines, one red and the other blue, cross the page describing the frequency of searches (or popularity) for two competing terms. The result resembles an electrocardiogram in which we can see the “life” of a particular word, as opposed to another, in a simple but eloquent dialogue of abstract forms. Callanan has chosen to confront terms in pairs such as “summer vs. winter”, “climate change vs. war on terror” or “global warming”. Simple as they may seem, the graphs are telling and constitute and visual summary of the book whilst suggesting many other reflections. The final conclusion is presented in the last graph, in which the perception of climate change is expressively described by the image of a vibrant line for the word “now”, much higher in the chart than the flat line for the word “later”. 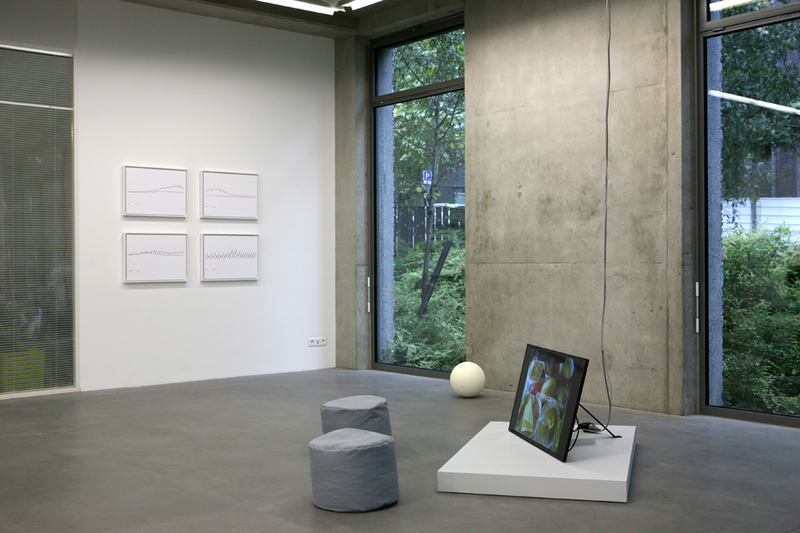 Roger Frank Malina, “Leonardo Timeshift“, Ars Electronica Catalog Archive. R. Hamblyn and M.J.Callanan. Data Soliloquies, 14. R. Hamblyn and M.J.Callanan. Data Soliloquies, 25. R. Hamblyn and M.J.Callanan. Data Soliloquies, 47. R. Hamblyn and M.J.Callanan. Data Soliloquies, 66. FutureEverything in Manchester commissioned a special issue of the Text Trends Newspaper to be given to every delegate at the 2013 Summit. 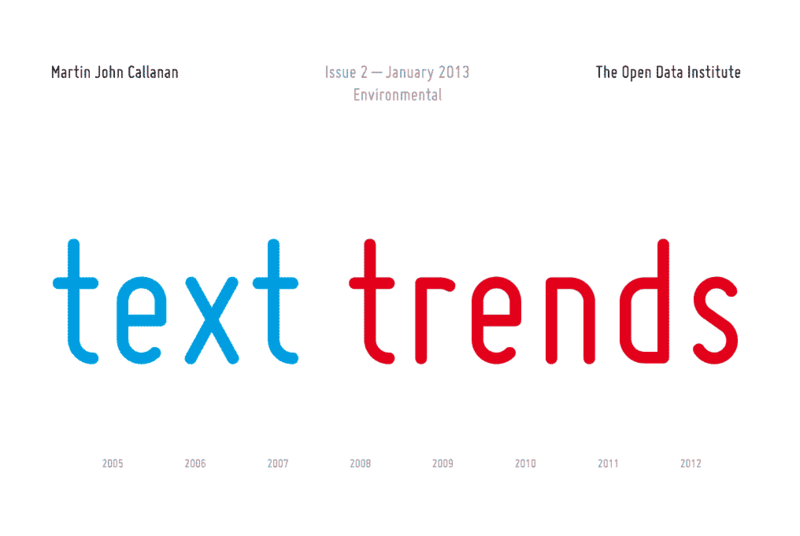 The second issue of Text Trends newspaper, looking at environmental data, will be available in limited numbers from 14 January 2013 at The Open Data Institute. 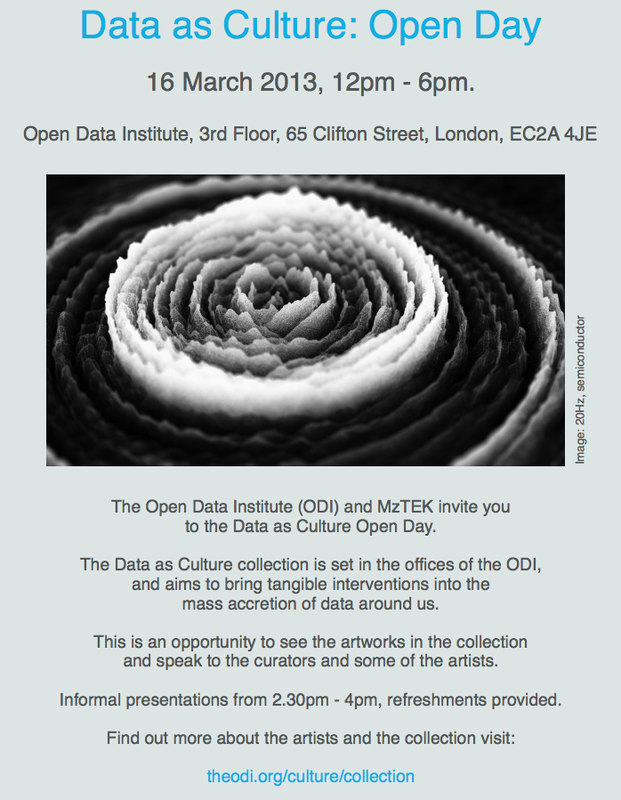 Introducing Friday Lunchtime Lectures at the Open Data Institute. and enough time to get back to your desk. Data is driving decisions that shape our daily lives: from friends to governments, we are becoming more reliant on connected data. Global opinion is increasingly communicated through data-driven visuals. Personal well-being, sentiment and influence are continually monitored through data-harvesting devices. Knowledge at all levels and on all topics can be handed to anyone, at any time. Open data is shaping our society. 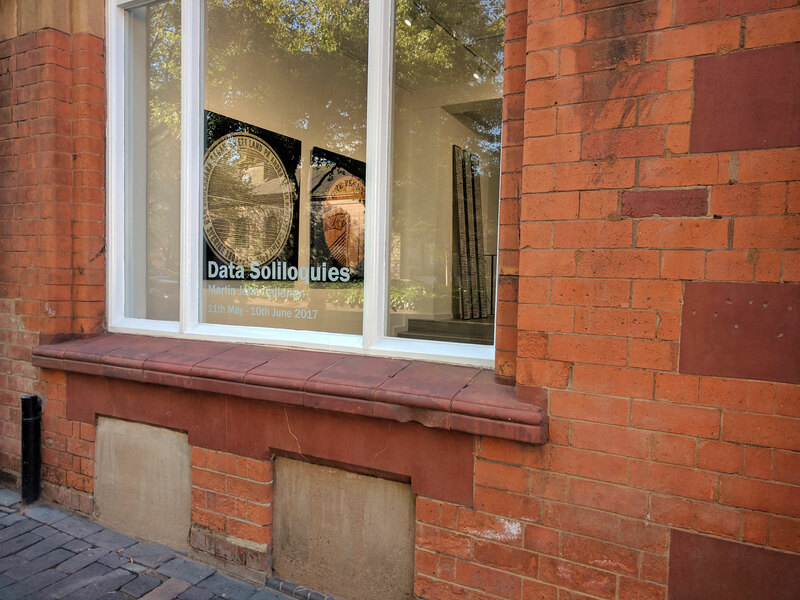 In curating the showcase for the ODI we wanted to select a range of works that would not just reflect different data sources, but that would challenge our understanding of what data is, and how it may affect and reflect our lives. 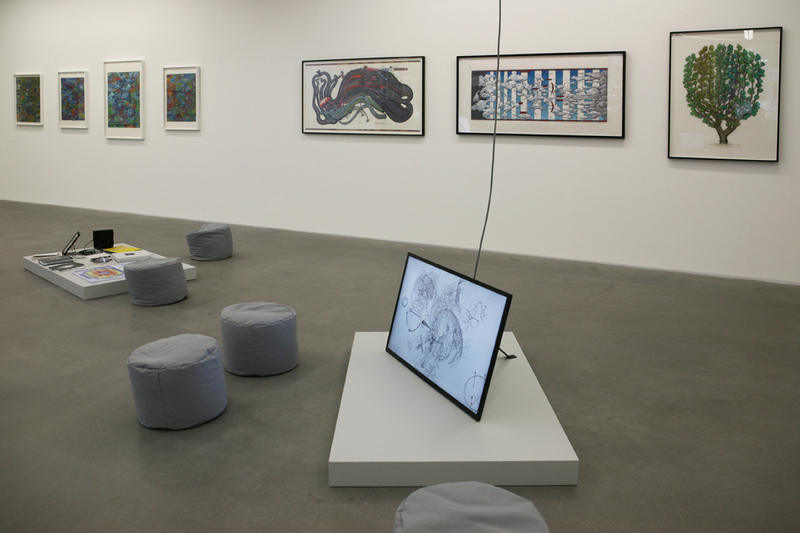 We were privileged in the breadth of content and the quality of work that was submitted as part of the open call, allowing for scope to select works that could comment on, complement and challenge perceptions in a coherent collection. 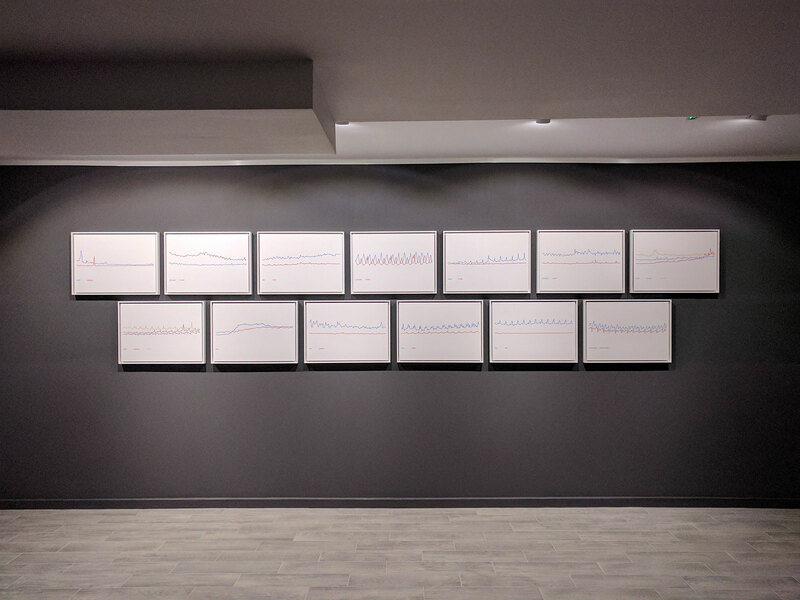 The works range from geomagnetic data visualisations, to wall painted cellular automata, to tabloid newspapers of search term trend graphs – all tangible interventions into the mass accretion of data around us. 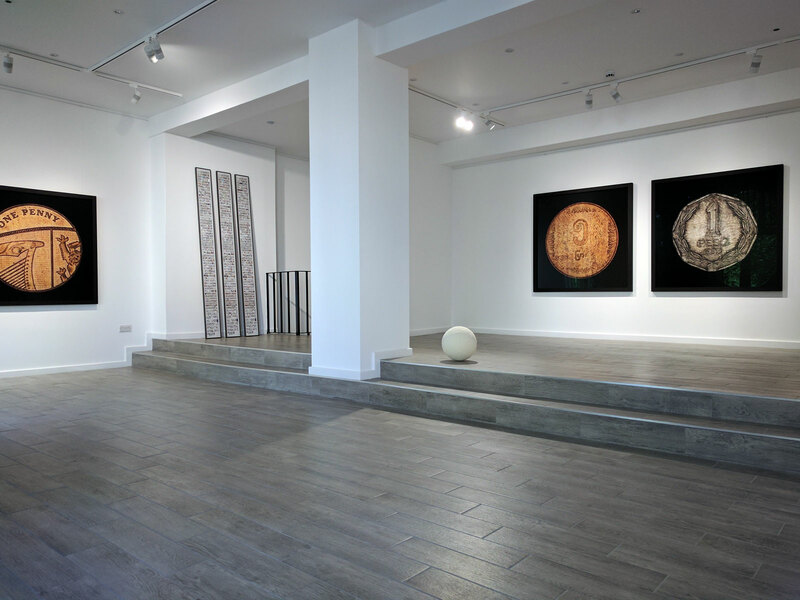 In Phil Archer’s work data comes from the depths of time, as symbolic representations of solar eclipses dating from 2137 BCE to 1991 CE are sketched in ultraviolet light. 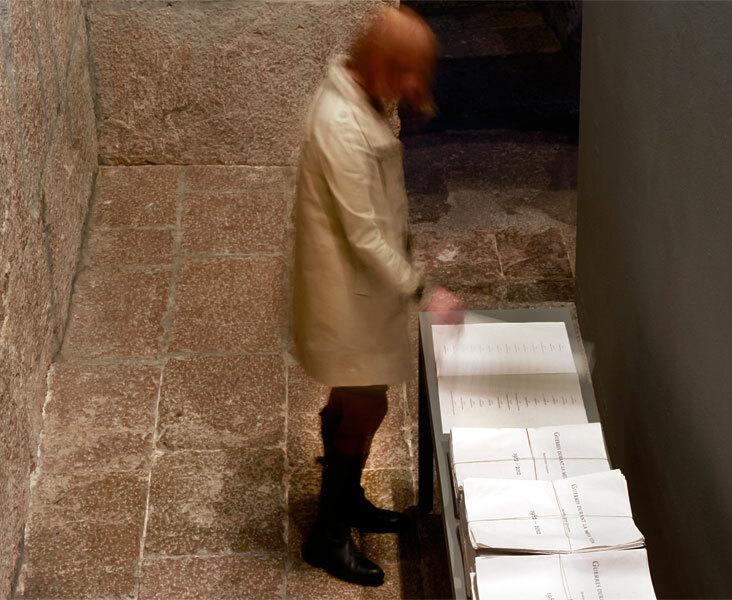 In contrast, ‘The SKOR Codex’ looks to preserve data for the distant future. The book, printed by La Société Anonyme, contains encoded binary information that has been carefully fabricated to last for over 1,000 years. The works span space as well as time, in ‘20Hz’, geo-magnetic storm measurements are taken from the Earth’s upper atmosphere, while ‘Metrography’ portrays the London Underground transit map as a spatial reality – data defining specious geography. In ‘Still Lifes and Oscillators 1’ the mistreatment of image data by reformatting, reducing, and regenerating, questions the representation of visual data as the ultra-processed image, as the final stable state from a cellular automata cycle is painted back onto the space it was captured from. Real-time environmental data is embodied in Stanza’s life-size sculpture assembled from computer components and acrylic slices of his own physique. In ‘Body 01000010011011110110010001111001’ the urban environment provides a dynamic flickering and clicking sentience to the otherwise inert structure, reflecting the personal level of influence data has on an individual, whereas Martin John Callanan’s ‘Text Trends’ reflects our actions en masse. 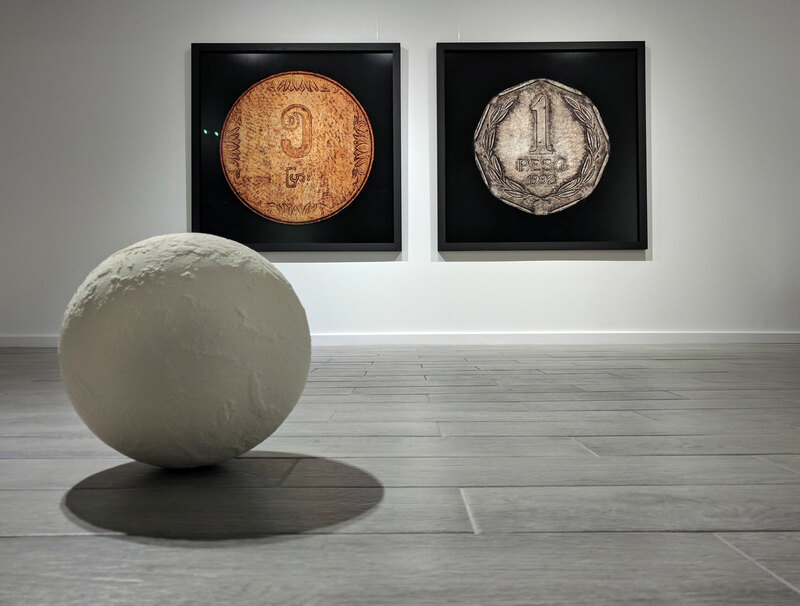 Works by Ellie Harrison and Fabio Lattanzi Antinori embody the current global political environment that is in constant flux, barely noticed on a personal scale, but that potentially have significant consequences for each of us. MzTEK worked with the ODI to encourage a broad spectrum of applicants, and in the interest of openness we will release the demographic data from the submission process. We would like to thank the ODI for all the support we have received, and for co-creating this with us. Finally, we would like to thank all of the artists involved for their thought provoking works and their professionalism in the production of this collection.